NYTECH has a diversity issue, and if the tech industry is to truly thrive it needs to be inclusive. Close the divide is one such initiative but it seems to target increasing the number of white females. Some call it a tech PR issue. It is a much greater divide. You cannot include those who you do not engage. A look at NYTECH meetups will show they do not reflect NY. 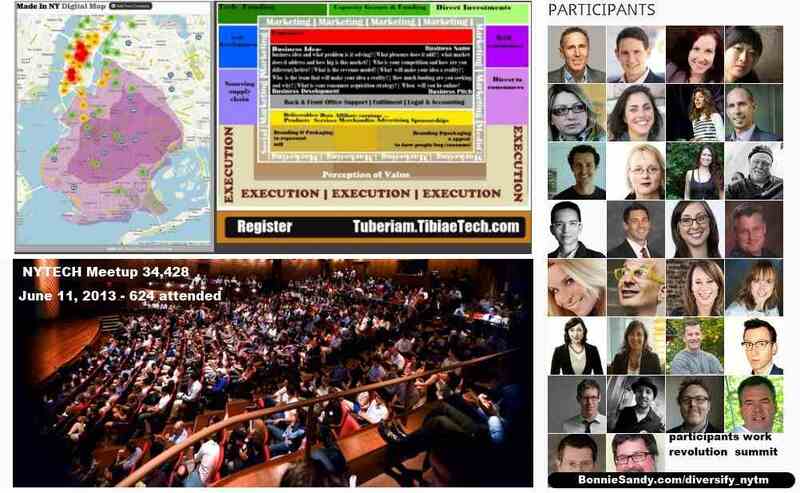 screen shot- compilation- top right, Work revolution participants; attendees of nytech meetup, diagram comparing NYTech startup and wifi access with low income and lack of local growth in BROOLYN mainly black community. all teh aspects of a strong ecosytem many untouched by tech. As a backdrop NYTM sent out a call for participants for it’s Work Revolution Summit on September 20th and 21st. My gut reaction was to ignore it but I have received much in terms of tech knowledge from this community and here was an area I could contribute. When I clicked on the link and saw the participants I shook my head. I again hesitated. I had learned from prior experience(with another NY organization) that often these calls were sent out to select persons… so that by the time you apply… space in filled. There is no transparency in selection. The schedule is attributed to Jessica Lawrence , Julie Clow , Josh Allan Dykstra . I questioned whether or not i wanted to be there or for that matter what they meant by “work revolution” was this managerial, workplace or worker. were it a private meeing I would have backed off, but it was sent out under teh aupices of the NYTM board. Why is it important because opportunity is filtered through these tech leader… do NOT discount their influence. This sector is BOOMING yet talent will be imported before it is home grown. A side effect is that lot of support and cash, funding is being thrown down the drain because of the current access trends. Not that they are not trying but they do not seem to have a policy of inclusion, do not appear reach out to NY’s larger community! Here is the response cc’d to two other members of their board. Thank you but , actually Jessica I am NOT surprised. However for clarity may I ask what is the criteria. Looking at NYTM it seems that, the selection process at NYTM has excluded many who have need of info as well as many who can contribute. I’m not quite sure what type of “pattern- matching criteria is employed and frankly I closed your reply and was about to delete when I realized I was NOT being the change I sought.NYTM has a HUGE diversity problem… as I look at images of this community it does not reflect the NY I know and love. As I looked at the roster I became aware that the direction was not to be inclusive. Then I took a look a t myself and realized I had NOT applied simply because I understood that I would not be selected. How many more simply do not participate because your programming never reflect them… I am not speaking solely of race. I am speaking of the broader talent pool. NYTM as it currently stands exist outside the realm of the average New Yorker.I applied simply because I believe one cannot complain (even privately) if you are not even making a move to correct the situation. Frankly I have no idea what else but ability to speak on the matter was needed your process was NOT transparent.I could make the excuse my hands are filled. However last week on the 50th anniversary on the march on Washington. I accidentally had the new signal app on when I posted via email to two meetups. Blacks in Technology 1, 169 members 287 people opened that listing. … and lastly everyone has freewill to open items on the mailing list… but still that is an indication of a larger problem. I was and am, shocked and disturbed.The purple area in the map and image shows the MappednNY map, wifi access in relation to poverty and unemployment. Maybe your work revolution summit is focused on managerial revolution. There is no indication…About 3-4 years ago I became more involved in the local communities and found that in a city with such a “vibrant’ tech community many who needed it have been cut off from it. There exist a subtle arrogance that “we can solve” the problems of others without first engaging them, without acknowledging that what we seek to solve may be out there.Many do not participate because they feel left out. I understand “space” issues but “Closing the divide’ or should I say ‘divides” will not happen with the current modes of selection. Moreso I see many tech companies that are really good going out of business because of that isolation.I learned very early on that access in NYtech scene is not all it appears, whether that is by design or an accidental side effect of “democracy” it is NOT working. I do not believe it is 100% cRacism.Simply put it is a type of “nepotism” common in developing countries based on telling and including “who we know and trust’ first. By the time info gets to “others’ space is filled. I’ve CC’d (Nate as well as will post) because this has to change… the NYTech has to be inclusive to all boroughs and all people. BEFORE a public cry for diversity goes out! Another side effect (of this proverbial inbreeding) is a weakened ecosystem, for often what we believe we know is nowhere near what actually is. As someone using technology to help creative industries across the world and seeing 20-30% increases in sales and independence work being created, I may have more than the average, more than many listed to contribute to this conversation. I may actually have something to contribute to the NYTECH community, like many who are not part of the core deeply tech qualified. But how will you or any of the others know what matters if they do not know it exist. I am the mother of a 21 year old who seeing the lack of opportunity and the dire situation in NY, is constantly afraid that this disparity will ignite, leaving in it’s wake not just business but human tragedies. If I am to be honestly I do not have the time and to a certain extent the enthusiasm. However if things are to change those of us who can must. It does not have to be myself… but you need to INCLUDE those who live and work in this city. Who understand it’s culture and the cultures of it’s workers. May I suggest you reach out and diversify. tech is code but CODE alone will not fix the workplace. LOOK at your participants, look at your events, look at NY city. That work revolution has to be inclusive. Posted in Latest and tagged #signal, As I See IT, Close the divide, Creative Industrialism, Latest, nytech, NYTM, Tech Evangelism.